This villa is on the private residential area of Montana Roja (Red Volcano) in Playa Blanca, which is overlooked by the stunning extinct Red Mountain Volcano, and has magnificent sea views. 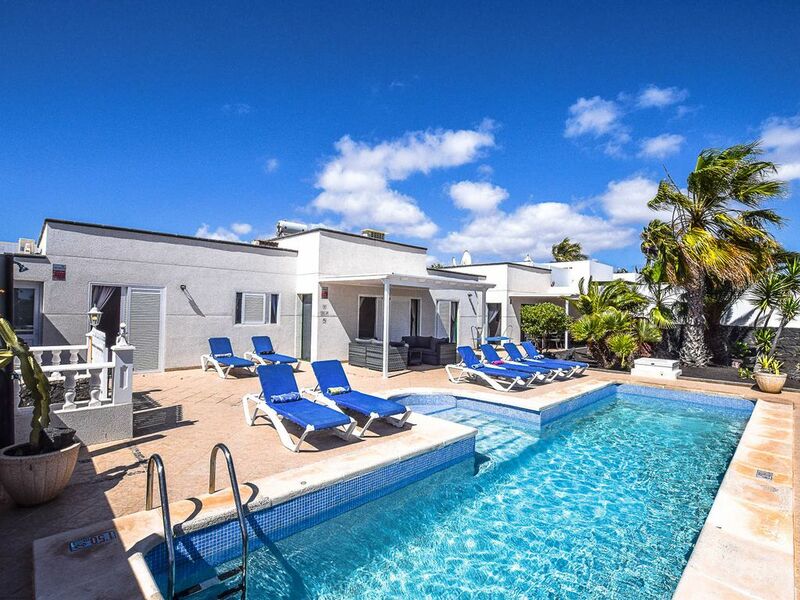 The property, has a private heated pool, JACUZZI, sun bathing terrace with built in Canarian style BBQ, a sun filter Hammock, 2 large parasols, 8 comfortable sun-loungers, 8 patio chairs and 2 patio tables. Inside you have a magnificent kitchen, lounge, and dinning area, leading directly on to the sun terrace, as do 3 of the 4 bedrooms. Each bedroom is fitted with an individual Air-conditioning unit that also acts as a Dehumidifier, Heater,or Air Purifier/Filter for perfect sleeping conditions irrespective of the weather. They work on a coin meter system and are available to all guests. The bedrooms are made up of 1 Superking room, 1 king room and two twin rooms. There are three bathrooms, two with showers, one being a large walk in shower and the third bathroom has a shower over the bath. The property has Satellite TV, DVD, Video, and CD equipment. In the fitted kitchen there is a large fridge-freezer, dishwasher, microwave, toaster, ceramic hob, full sized oven, and all cooking utensils required. Towels and linen are all provided, and changed every full week of your holiday. A WELCOME PACK: - consisting, of tea, Water, Sugar, Orange Juice, Beer, Coffee, Milk, Biscuits, Wine/Cava is included in the above prices. We are happy to provide additional food for your holiday, please let us have your list, and you can pay us for this on your arrival. 1 shower room has been made suitable for a wheel in shower chair. These can be hired locally. The villa was very nice and the owners and managers were helpful, friendly and accommodating. One of the guests was a wheelchair user and the villa was extremely suitable for her use. The doors were wide enough and access in and out of the villa was really good. We hired an electric buggy, which we could also get in and out of the villa very easily and we could get to the nearby Hotel Timanfaya and the Flamingo beach in about 10 minutes. Access to one of the showers was also excellent, being a 'roll in' type. The only disappointment for the wheelchair user (and as would be for children) was that the pool was so deep (I think it was 1.5m - just under 5 feet - at the shallow end). Although the villa was very nice, it is perhaps not quite 'luxurious' as described on the website. There wasn't a clock in the house for example and the sea view wasn't 'stunning' (I would chop down one of the bushes which conceals a sea view from the pergola area nearest to the living room). The rooms were nice and spacious and the villa was nicely secluded and not overlooked. It was a very pleasant stay and we would be inclined to return, but for the depth of the pool. It is also approximately a 10-minute walk to the Harbour where you can catch the frequent ferry to Fuerteventura, which is approx a 40 minute crossing time. A further 10-minute walk along this promenade, which has a wonderful display of Canarian shops restaurants and bars, you arrive in the old centre of Playa Blanca, with its magnificent beach. The world famous beaches of Papagayo are only a short drive from your villa. 1. Rates are based on 4 people. Please add an additional £105per person per week up to a maximum of 8 people. 2. For your comfort from 1st&nbsp;October to30th&nbsp;April use of the electric pool heater is FREEand will give an approximate water temperature of between 26º to28º C - weather dependant. If you would like additional poolheating during the summer months, please add an additional £100 perweek. 3. Cots and highchairs are available to rent from a localcompany. They can be pre-ordered and waiting for you at the villaon your arrival. These cost €25 per item per week payable onarrival. PLEASE NOTE: If you are travelling with a small child, wedo not provide bed linen for cots due to the sensitive nature of achild's skin and the risk of allergies. 4. All holiday bookings are subject to a 5% service fee. Adeposit of 15% of the total holiday price must be paid before theholiday booking can be confirmed. The balance of the holiday priceis to be paid via Credit/Debit card or Bank Transfer and must bereceived at least 8 weeks before the holiday start date. 5. PLEASE NOTE: We ask for a standard ��400 REFUNDABLESECURITY DEPOSIT on any booking to cover damage that may occurduring your stay. This is payable either in cash on arrival or viabank transfer two weeks before your holiday starts. However, wehave a "BREAKAGES INSURANCE POLICY" in place and for a small fee of£7.50 per guest, per booking (non-refundable) your party will becovered for the first £500 of any damage caused and negate the needto pay a security deposit. 6. Why not treat yourselves to the luxurious hot tub this villabenefits from. Costing only £95 per week. 7. Unlimited WiFi access is FREE.